It’s time to spring forward! 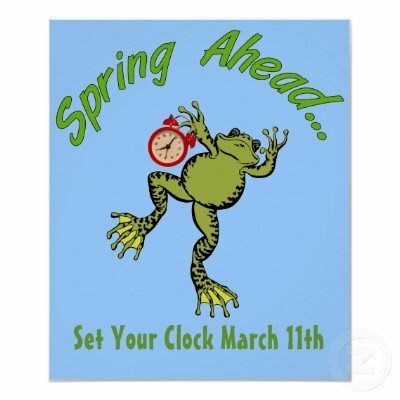 Daylight Saving Time begins at 2:00am on Sunday March 11th! Be sure to set your clocks ahead one hour; or you might find yourself an hour late for work on Monday. Unless you live in Arizona, Hawaii, the U.S. territory of Puerto Rico, or the Virgin Islands; those areas don’t observe Daylight Saving Time so there’s no need for you to change your clocks. Did you know there are 164 countries and territories around the world that do not observe Daylight Saving Time? That’s far more than the 75 that do! Although Benjamin Franklin is most commonly credited with thinking up the Daylight Saving Time idea, that’s all he really did – think about it. It wasn’t until 1895 when New Zealand entomologist George Vernon Hudson presented the Wellington Philosophical Society with a written proposal for a two-hour daylight-saving time shift, that any real interest in the concept was shown. No real law or order concerning Daylight Saving Time was implemented, however, until World War I, when Britain and Germany used the time concept to conserve energy. In the Unites States, Daylight Saving Time was used briefly during World War I, but it wasn’t widely accepted across the country until after the 2nd World War. In 1966, the Uniform Time Act was drafted, stating that clocks should be set forward on the last Sunday in April and set back the last Sunday in October. In 1986 the law was amended to set the first Sunday in April as the start of Daylight Saving Time; the end date however, remained the same. The law was again amended in 2006, this time making the second Sunday in March the start of Daylight Saving Time, and the first Sunday in November the end. For information on the when and where of Daylight Saving Time around the world, visit www.daylightsavingstime2012.net/. Daylight Saving Time means longer days, but it also means one less hour of sleep the night of the time change. According to some experts, the “spring forward” time change is disruptive to your sleep and could lead to such health issues as heart attacks, so it’s wise to plan accordingly; be prepared to feel more tired than usual the next day or two while your body and mind adjust. Some 70 to 80 percent of people aren’t significantly bothered, said Dr. Shyam Subramanian, director of the sleep center at University Hospitals Case Medical Center in Cleveland, and can adjust successfully in a day or two. Others yawn their way through the week. For them, the consequences can be grave. Rates of workplace and traffic accidents, as well as of heart attacks, rise in the days following the spring time change. One study showed a nearly 6 percent rise in workplace injuries on the Monday after the daylight-saving switch. In the days, and even weeks, following the start of Daylight Saving Time, please be extra careful while driving and participating in other activities that require you to be as alert as possible. The life you save could be yours! To help combat the fatigue that comes with Daylight Saving Time, sleep experts suggest you prepare for the time change three or four days before, by going to bed 15 or 20 minutes earlier than usual. – Help adjust your body’s circadian rhythm by exposing yourself to daylight soon after you wake up. – A cup of coffee or other caffeinated drink is ok in the morning, but it’s best to avoid caffeine in the mid-afternoon and evening hours. – Do your best to avoid bright light in the evening. Even the light from a computer screen can throw off your circadian rhythm. – Make your bedroom your quiet sanctuary with a comfortable bed and no bright lights; listen to white noise to drown out distracting noises if necessary. This entry was posted on Wednesday, March 7th, 2012 at 9:57 PM	and is filed under Misc.. Both comments and pings are currently closed.